Dani Alves reaction in eating the banana that was thrown from the Madrigal stands has travelled around the world. In the last few hours, this particular fruit has become a global symbol of the condemnation of racism. 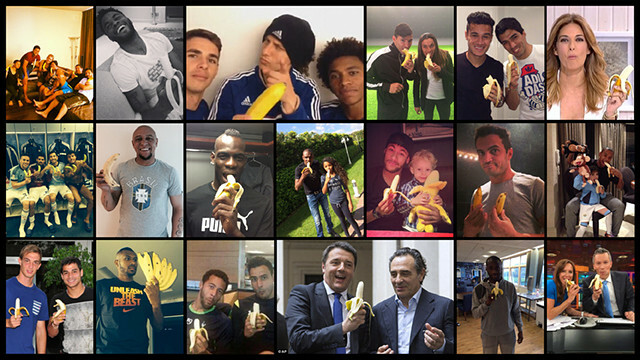 After Alves reaction, social networks were flooded with messages of support for the Brazilian, the most used hashtags being #somostodosmacacos, #weareallmonkeys o #totssommonos. Thousands of people have been photographed with bananas. One of the first was Neymar, out through injury against Villarreal, in a picture taken with his son. Abidal, Aguero, Fernandinho, Marta, Balotelli, Luis Suarez, Coutinho, Lewandowski, Lucas Moura, Marcos Senna, Hulk, Bebeto, and Roberto Carlos are some of the players and former players who have publicly expressed their opposition to racism and stand with Dani Alves. But the gesture of the defender, in addition to crossing borders, has also made an impact beyond the world of sport. There are journalists who have eaten a banana against racism in front of the cameras, as well as renowned chef Sergi Arola, and above all, the Italian Prime Minister, Matteo Renzi, alongside the Italian National Coach Cesare Prandelli. The Secretary-General of the United Nations, Ban Ki-Moon, the Brazilian President Dilma Rousseff, and FIFA President Sepp Blatter, are other personalities who have spoken out against racism following the Alves reaction. With all this, Dani Alves lives in the hope that this racist incident “serves in some way to stop this kind of attitude”. He added: “I hope all the repercussions, which just began as a carefree joke, are successful”. In an interview with The National Journal of Globus Esporte, the Barça player said: “We are in the twenty-first century, the world has changed and we must evolve with it. We can’t stay behind the trend”.